In a special issue of Japan's JAZZ LIFE magazine, they selected the 22 All-Time Greatest Jazz Guitarists. 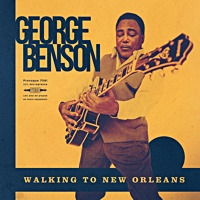 Of course, legends like Charlie Christian, Django Reinhardt, Wes Montgomery, Kenny Burrell, and Jim Hall were included alongside more recent giants George Benson, Pat Martino, Larry Coryell, and John McLaughlin. 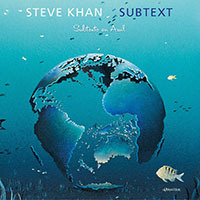 But right there amongst contemporaries John Abercrombie, Pat Metheny, John Scofield, Mike Stern and Bill Frisell was Steve Khan! Testament to a large body of work which now spans more than 30 years. Hard to believe this dream began at a rather late age with Wes Montgomery held as the model to which to aspire. Steve admits that, when he was a teenager, I was a terrible drummer with no musical training. I had developed a love for the guitar, and when I was 19 I switched instruments. I decided that I would not make the same mistakes I had made with the drums and studied hard in college along with private lessons from Ron Anthony. During these years, Khan always found himself in fast company and, from such situations he learned, developed and survived. By the time he graduated from U.C.L.A., in 1969, he felt ready to make the move to New York City. In 1980, Steve recorded a brilliant solo acoustic guitar album, EVIDENCE, which paid tribute to his earliest jazz inspirations and served to establish him as one of the great interpreters of the music of Thelonious Monk. 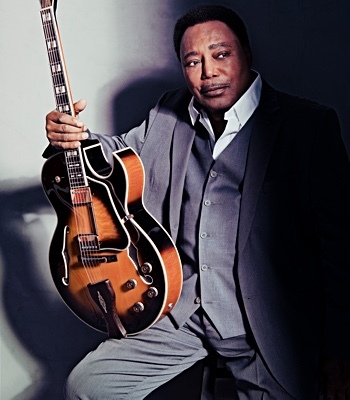 Between 1981 and 1985, he worked and recorded steadily with his quartet, Eyewitness, which included Anthony Jackson, Manolo Badrena, and Steve Jordan. Together they made three recordings: EYEWITNESS('81), MODERN TIMES/BLADES('82), and CASA LOCO('83). 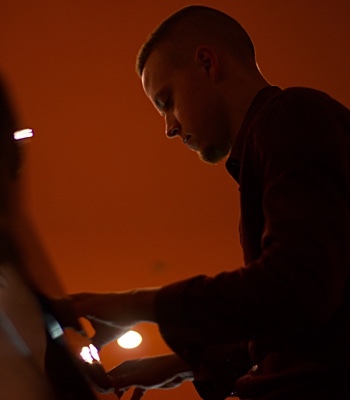 During 1984, Steve joined with Steely Dan's Donald Fagen to interpret Thelonious Monk's Reflections for the THAT'S THE WAY I FEEL NOW recording which was a tribute to Monk and his compositions. When the group needed a break, Khan joined Joe Zawinul's WEATHER UPDATE for it's one and only tour in '86. 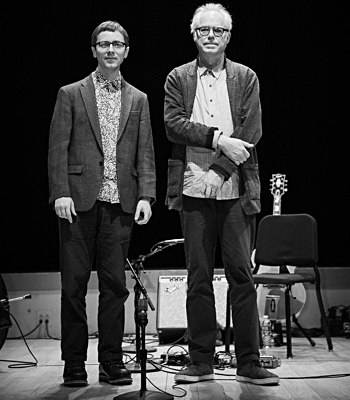 This was followed by an innovative duet recording with keyboardist Rob Mounsey. The Grammy-nominated CD was titled LOCAL COLOR and was released in '87. 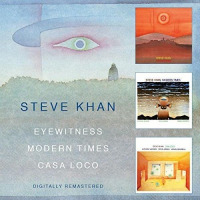 In 1989, EYEWITNESS was resurrected with Dave Weckl replacing Steve Jordan for the PUBLIC ACCESS ('90) CD. Since that time, Steve has added two groundbreaking straight- ahead jazz recordings featuring Ron Carter and Al Foster. LET'S CALL THIS and HEADLINE were released in '91 and '92 respectively. In '94, Steve found himself back in the company of Anthony Jackson and Manolo Badrena, adding Dennis Chambers and Michael Brecker for CROSSINGS, which is dedicated to the memory of Steve's late father, lyricist Sammy Cahn. Recently, Steve has contributed his talents to several special projects. His unique medley of two George Harrison tunes graced Mike Mainieri's NYC Records COME TOGETHER, A Guitar Tribute to the Beatles. Here Steve was accompanied by Marc Johnson, Peter Erskine, and Nana Vasconcelos. Special Olympics and the Holiday Season brought Steve together with the Brecker Bros. for a Salsa-styled interpretation of his father's one Christmas song, The Christmas Waltz, which appeared on the JAZZ TO THE WORLD CD. 1996 saw Steve teamed with Argentine vocalist Gabriela Anders, Rob Mounsey, and, New York Salsa All-Stars Rubén Rodriguez, Marc Quiñones, and Papo Pepin to contribute Don't Worry Baby(No Te Preocupes Nena) to WOULDN'T IT BE NICE. a tribute to Brian Wilson. Recorded in 1996, GOT MY MENTAL brings Steve together for the first time with John Patitucci on acoustic bass and Jack DeJohnette on drums. 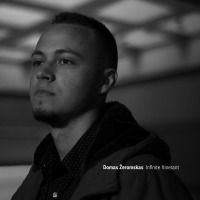 The CD once again finds him using his unique playing and arranging perspective to interpret the works of Wayne Shorter, Ornette Coleman, Lee Morgan, Eddie Harris, and standards by Rodgers & Hammerstein as well as Steve's father with Jimmy Van Heusen. The latter is a stunningly beautiful rendering of the Sinatra classic The Last Dance. On four of the eight tracks, the trio is joined at times by percussionists Bobby Allende, Marc Quiñones, and Don Alias. Brasilian percussionist Café lends his special talents to Steve's romantic journey through I Have Dreamed. The intensity and creativity brought to the sessions shows Steve's unfailing desire to meet new challenges and explore them. These qualities cause his name to always be mentioned when discussions of contemporary jazz guitar are carried on. 1997 saw Steve reunite with Rob Mounsey to record YOU ARE HERE. It had been nearly 10 years since the release of LOCAL COLOR and the duo was anxious to get back at it again. 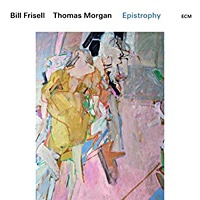 Like the prior CD, when these two tremendous musicians get together the music tends to defy categorization, but the new recording seems to sit somewhere between a contemporary version of Latin jazz and World Music jazz. Also in keeping with their previous work, Steve is again heard on only acoustic guitars. Reminding us all, that he is one of the instruments most unique stylists, playing melodies and solos with a touch and phrasing all his own. One brand new dimension for YOU ARE HERE was the presence of Latin percussion virtuoso Marc Quiñones. Marc brought his spirit and power to signature compositions by Khan-Mounsey like Clafouti, Platanos Maduros, and Peanut Soup. Released in September of 1998, the recording leaves little doubt that Steve and Rob are blazing a trail of their own making while presenting music with broad appeal. In August of '98, Steve toured Japan as part of Dave Samuels' Tribute to Cal Tjader Group. Apart from the tremendous reaction the group received, the tour was to have more far reaching consequences as it was here that plans were made for Steve, Dave Samuels and Dave Valentin to become the co-leaders of the reformed Caribbean Jazz Project. After some isolated tour dates in early '99 for the group, Steve and Dave Samuels were asked to appear on Dave Valentin's first recording for Concord Records. Upon hearing those performances, Concord president, John Burk, asked to sign the Caribbean Jazz Project to his label as well. As a result of these chance events, the group's first recording with the new line- up (which included, John Benitez: bass; Richie Flores: congas; Robert Vilera: timbal), was titled NEW HORIZONS and was released on Concord Picante during February, 2000. After extensive touring, April of 2001 saw the release of the Caribbean Jazz Project's 2nd CD PARAÍSO which became an instant 'classic' in the genre. However, in January of '02, citing conflicts over the group's direction, Steve chose to leave and pursue other interests. Throughout his long and distinguished career, Steve has found time to lend his talents to recordings by such diverse artists as: Miles Davis, Steely Dan, James Brown, Aretha Franklin, Chaka Khan, Quincy Jones, Eddie Palmieri, Freddie Hubbard, the Brecker Bros., Steps Ahead, among others (too numerous to list). 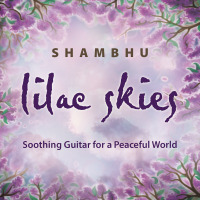 He has also produced recordings for fellow guitarists Larry Coryell, Mike Stern, Bireli Lagrene, and Bill Connors, as well as pianist Eliane Elias. 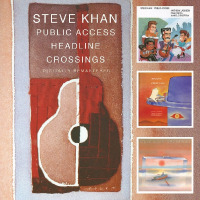 In addition, he has published fiv highly-regarded books: WES MONTGOMERY GUITAR FOLIO, PAT MARTINO-The Early Years, GUITAR WORKSHOP SERIES-Steve Khan(this book really functions as an Eyewitness Songbook), and most recently, CONTEMPORARY CHORD KHANCEPTS. 2002 saw the long-awaited publication of Steve's PENTATONIC KHANCEPTS which is intended to serve as the linear adjunct to its chordal predecesor. 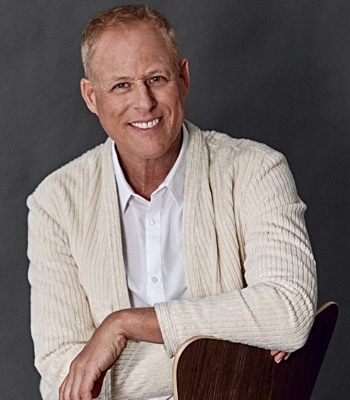 While continuing to perform in clubs and concert halls throughout the U.S., Europe, Central and South America, and Japan, Steve has also become one of the most in-demand music clinicians and teachers. 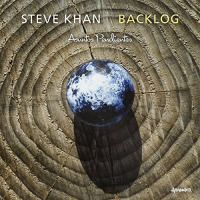 Steve Khan: The Making of "Parting Shot"
Steve Khan: Reflections on the Making of "Borrowed Time"
All About Jazz musician pages are maintained by musicians, publicists and trusted members like you. Interested? Tell us why you would like to improve the Steve Khan musician page.